The ability to grow and reflect as an educator is crucial for me as a professional. One of the reasons I love the way new learning standards are reshaping teaching is by leveling the playing field between teacher and student. I believe this should happen in the K-12 classrooms but also beyond into college and later in professional development. In order to solve the most challenging problems our society faces, we must be able to think critically about the world around us. I have always wanted to be a lifelong learner, but it wasn’t automatically built into my experience as a pre-service teacher or as a licensed educator. Before my path toward my Master of Arts in Educational Technology (MAET) at Michigan State University, I was a decent science, technology, engineering and math (STEM) teacher and really solid with science and science instruction. In the educational climate where I teach, there is an emphasis on becoming a “master teacher,” but to me, part of having that title is not that you have all the information to bestow on others, but that you are able to reflect, learn, and revise instructional practices based on that continued learning. My MAET experience helped fuel this pursuit of knowledge by framing my journey in such a way I could put learning into practice. It began during the summer of 2014 when I was accepted into the MSU-Wipro Urban STEM Fellowship at Michigan State. As a professional development leader myself, I was in awe of the planning and effort that went into ensuring the success of each individual teacher involved in the fellowship. Teachers were selected based on their desire to improve themselves professionally and personally. I was among friends and felt like I finally found what I had been searching for. We questioned, we explored, we challenged each other and were challenged by dedicated professionals who wanted to share their passion for education. We were pushed to new limits and were treated with respect and candor that embraced how difficult our job is, while simultaneously showing us that we were capable of more than we are normally given credit for. To this day the fellowship is in my top 3 professional development experiences because of the attention to detail that was given to the structure and content. We began with an intensive summer institute, followed by a year-long project and regular in-person meetings throughout the duration. Additionally, virtual learning spaces were used in addition to enhance the collaboration in creative and engaging ways. It definitely felt like a whirlwind fairytale. It wasn’t until the MSU-Wipro Fellowship that I saw how transformative technology could be within my own teaching. The Counseling, Educational Psychology, and Special Education (CEP) MAET courses included in the fellowship were a combination of CEP 815: Technology and Leadership, CEP 806: Learning Science with Technology, and CEP 805: Learning Math with Technology. These courses pushed me to truly feel like I can call myself a teacher of technology because I have built on the principles and fundamentals of what it actually takes to bring technology to the classroom. Throughout my years as an educator, I had explored almost every professional development in science almost to the point of exhaustion. Focusing on the T-E-M in STEM allowed me to access new avenues within science education. I learned how to use technology to enhance my teaching, not replace it with a machine. I was exposed to technology tools and have since incorporated innovations like Makey-Makey, Squishy Circuits, littleBits, and the maker movement into my curriculum. The program would be a renaissance for my pedagogy. The enthusiasm the MSU team shared with our cohort was inspirational. It was clear that the program was, from inception, dedicated to revolutionizing teacher professional development in a district that so desperately needed it. Even just the idea of working with a group of colleagues that could inspire me and take my own learning to a new level was exciting. Little did I know the wild ride I was in for. Working closely with Punya Mishra, Candace Marcotte, Kyle Shack, Akesha Horton and Leigh Graves Wolf—many of whom are products of the MAET program at MSU. The success they found within and after their individual experiences led me to pursue my second master’s degree with the MAET. When the program ended, I knew my connection to MSU didn’t have to end, nor did the connection to the wonderful educators I appreciated learning from. We reclaimed social media for its original purpose of collaboration and communication and I was able to see my new friends continue their success after our formal fellowship ended. In 2016, I transitioned out of the classroom and took some time to regroup and reframe my personal learning progression. I understood the importance of how classroom instruction provides opportunity for reflection. I was always able to take actionable steps in my pedagogy by applying what I was learning as a formal educator. When I stepped out of the classroom, I became a partnership coordinator and educational consultant. I shifted from working more with adult learners and less frequently with young learners. My early career started as an instructional coach so it was important for me to take inventory of how I have grown and what direction I wanted my growth to take after. When I enrolled in CEP 817: Learning Technology by Design. Empathy was a pivotal piece of learning for me in this class given the other engineering design methods I had previously lacked beginning from a place of empathy. The district I work with was also entering a massive launch to provide equity, diversity, and inclusion training to all staff. There are clear parallels between empathy and equity, but it was a powerful combination for me in the new capacity of my profession. The timeliness of the both pieces coming together helped reframe my thinking so that my professional work always begins with knowing my audience and reflecting on how I’m using the lens of equity. When I’m working with students at the university I’m trying to learn about their experiences and how it could shape the mentor work they do with K-8 students. Knowing their individual backgrounds helps me find outreach opportunities that highlight the experience for the mentor and mentee. When the district recently took on an engineering design project, I was able to support in and out of school teachers in looking at the Stanford Design Thinking Bootleg by collaborating on the curricular writing process. The project connected with the city’s top concerns around climate change. I was definitely more equipped to support the collaborative effort having completed this course and diversifying my expertise. All of the above work ultimately designed to support the teachers, students, and community. While taking CEP 822: Approaches to Education Research I had an opportunity to push my equity, diversity, and inclusion training further by providing a platform to research the implicit bias work. As a research scientist, my work always relied on following current research and revising thinking based on advancements in STEM. Although I have extensive research experience, this class helped me dust off some skills I had not used in a while. Science research and social science research often use similar techniques when looking at data; however, educational research requires a different approach. It was the perfect blend of skill and application refreshing the skills I was familiar with and adding on in a domain I needed more practice in. Working for a university that produces leading scholars from such a wide range of disciplines, I should be able to speak about and disseminate work that pushes our thinking forward as a society. As a lover of knowledge, I had the chance to practice how comparative research methods allowed me to dispel myths and misconceptions and support pedagogy with current research. My research during this course largely focused on implicit bias and gender bias in education. Our future directly depends on generations of well rounded human beings that are critical thinkers and are not bogged down by the limitations of human opinion. We need everyone at the table and I am striving each day in my career to find opportunities to teach myself how to model this. The MAET program emphasized how to think creatively and turn that thinking into action. I am a firm believer that you must lead by doing. Whether I am working with teachers or young students, I need to model the skill sets I am expecting my audience to work with. Making professional decisions that are backed in research is at the heart of what I consider to be “data-driven”. Too many educators are forced into a system where they are expected to do great work without the training and the autonomy to make decisions in the environments they work in. We must continue removing the barriers that face many of our students and provide them with the 21st Century Learning Skills necessary to keep up with advancements of technology. This is my second master’s degree and the experience was wildly different than my first master’s. My original intention was not to pursue a second master’s, but it was an opportunity I could not pass up. My first program was more of a foundational teaching and learning program that covered a wide range topics, more breadth vs. depth. What drew me to the MAET program was knowing that that foundation would be built upon, and more specifically in a content area I was drawn to. I could teach myself the best practices needed for technology instruction, but learning in isolation would have been a challenge. Teaching and learning should be a collaborative effort. Applying my MAET learning through the coursework was one piece of the puzzle, but learning the ways my classmates applied the same learning in different contexts was also a key piece. Most of all, the model that I believed in - learning by doing then sharing - was pivotal in my career. Embarking on a master’s pathway is not an easy decision, especially when you are already in a full-time job position. I would not have continued it weren’t for my experience with professionals that were products of the MAET program that could speak to the value the program provided for their continued learning. I saw how the program elevated their interactions in their own classrooms and how it shaped how they led professional development. The MSU family is far reaching due to their successful blended learning opportunities and I am grateful to be a part of it. The emphasis on leadership and collaboration has been instrumental in my growth. I have always found myself to be a tried and true scientist with a hobby in technology. 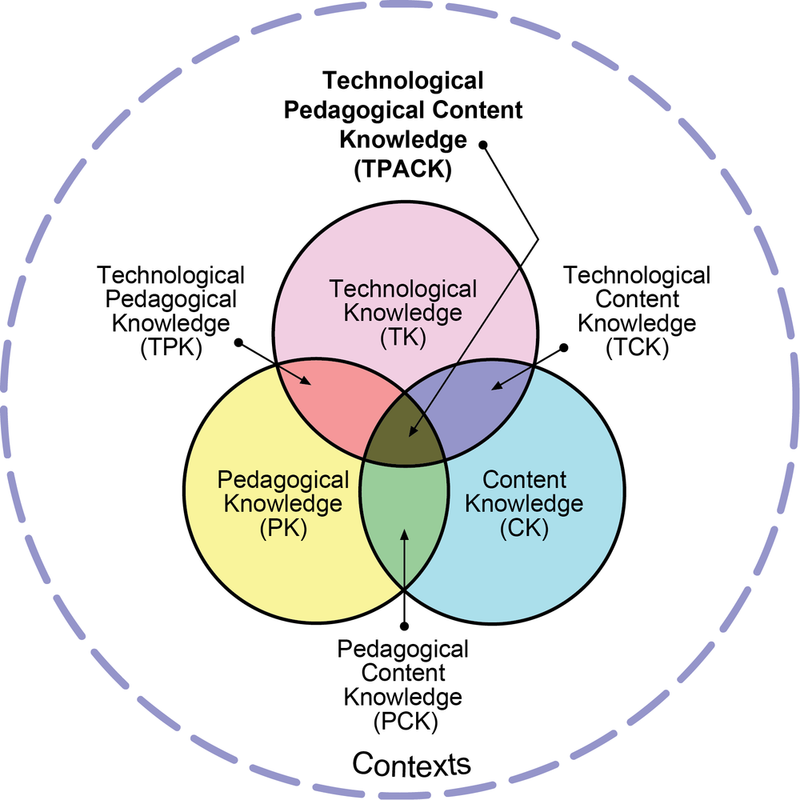 My pedagogical content knowledge (PCK) (Shulman, 1986) is rooted in critical thinking skills that I can model for any kind of learning audience I encounter. Over the course of the MAET program, I became more proficient with web-based, Mac and PC tools I avoided before, but also making sure I understand how students and adults can unplug (and not just because the Internet is down!). I am faster and more confident in my abilities and still continue to keep up with the technology learning curve knowing that my learning was not just focused on hardware and software. I added the “T” to my PCK, practicing the TPACK I learned to be more patient with myself and to embrace failure as the first-attempt-in-learning (F.A.I.L.) Most of all, I know I always have resources at my fingertips and colleagues to collaborate with regardless of where I reside or where they reside. Shulman, L. S. (1986). Those who understand: Knowledge growth in teaching. Educational Researcher, 15(2), 4-31.